Mcgee Jr., Harold Franklin . "Mi'kmaq". The Canadian Encyclopedia, 11 October 2018, Historica Canada. https://www.thecanadianencyclopedia.ca/en/article/micmac-mikmaq. Accessed 24 April 2019. Article by Harold Franklin Mcgee Jr.
Mi’kmaq (Mi’kmaw, Micmac or L’nu, “the people” in Mi’kmaq) are Indigenous peoples who are among the original inhabitants in the Atlantic Provinces of Canada. Alternative names for the Mi’kmaq appear in some historical sources and include Gaspesians, Souriquois, Acadians and Tarrantines. Contemporary Mi’kmaq communities are located predominantly in Nova Scotia and New Brunswick, but with a significant presence in Québec, Newfoundland, Maine and the Boston area. As of 2015, there were slightly fewer than 60,000 registered members of Mi’kmaq nations in Canada. In the 2011 National Household Survey, 8,935 people reported knowledge of the Mi’kmaq language. In the pre-contact world of Mi’gma’gi, oral and archeological history tells of seasonally patterned habitation and resource harvesting — spring and summer spent on the coast, fall and winter inland. The people of Mi’gma’gi relied on the variety of resources available, using everything from shellfish to sea mammals to land mammals small and large for nutrition, clothing, dwellings and tools. They also used the bountiful timber to construct canoes, snowshoes and shelters, usually in combination with animal skins and sinews. The Mi’kmaq relied wholly on their surroundings for survival, and thus developed strong reverence for the environment that sustained them. As of 2015, the number of people registered with Mi’kmaq First Nations was 58,763. 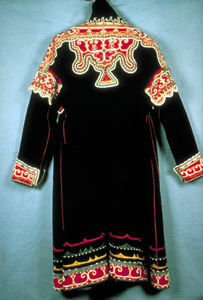 Of that total, 23,997 were members of the Qalipu First Nation of Newfoundland, a landless community officially recognized by the Government of Canada in 2011. Excluding the landless Qalipu, 56 per cent of Mi’kmaq people lived on reserves	in 2015. Mi’gma’gi is home to 30 Mi’kmaq nations, 29 of which are located in Canada — the Aroostook Micmac Band of Presque Isle, Maine, has more than 1,200 members. All but two communities (the Qalipu Mi’kmaq First Nation and La Nation Micmac de Gespeg in Fontenelle, Québec) possess reserve lands. Many Mi’kmaq people live off-reserve, either in Mi’gma’gi or elsewhere. More still may not be included by registered population counts, as they are not recognized as status Indians	under theIndian Act. 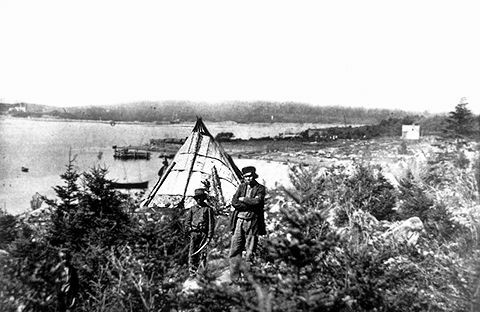 Historically, Mi’kmaq settlements were characterized by individual or joint households scattered about a bay or along a river. Communities were related by alliance and kinship. Leadership, based on prestige rather than power, was largely concerned with effective management of the fishing and hunting economy. Mi’kmaq share close ties with other local peoples, including the Maliseet and Passamaquoddy. With the Maliseet, Passamaquoddy, Penobscot and Abenaki	peoples, the Mi’kmaq make up the Wabanaki Confederacy, a confederation of nations politically active at least from contact with Europeans to the present. 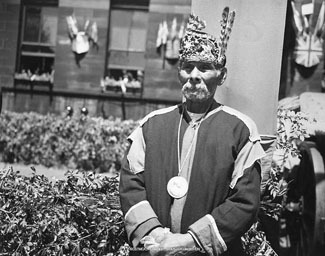 A Mi'kmaq Chief waits to be presented to their Majesties during the 1939 Royal Tour of Canada at Halifax, NS (courtesy Canada Science and Technology Museum/CN Collection/CN003696). The Mi’kmaq Grand Council (Sante’ Mawio’mi) is the traditional government of the Mi’kmaq peoples, established before the arrival of Europeans. The council survives to this day, although its political powers have been restricted by federal legislation, such as the Indian Act. In the past, the council discussed political issues and entered into treaties with the British in the 1600s and 1700s. The Council was also (and still is) considered the spiritual authority of the Mi’kmaq people. Today, the Mi’kmaq Grand Council members advocate for the promotion and preservation of Mi’kmaq people, language and culture. 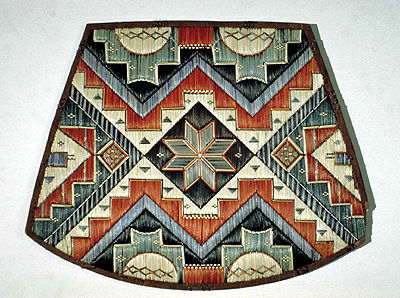 Mi'kmaq quillwork chair seat (courtesy Glenbow Museum/Canadian Ethnology Service, CMC). Mi'kmaq moccasins, circa 1830 to 1840. Music is another important element of Mi’kmaq culture. 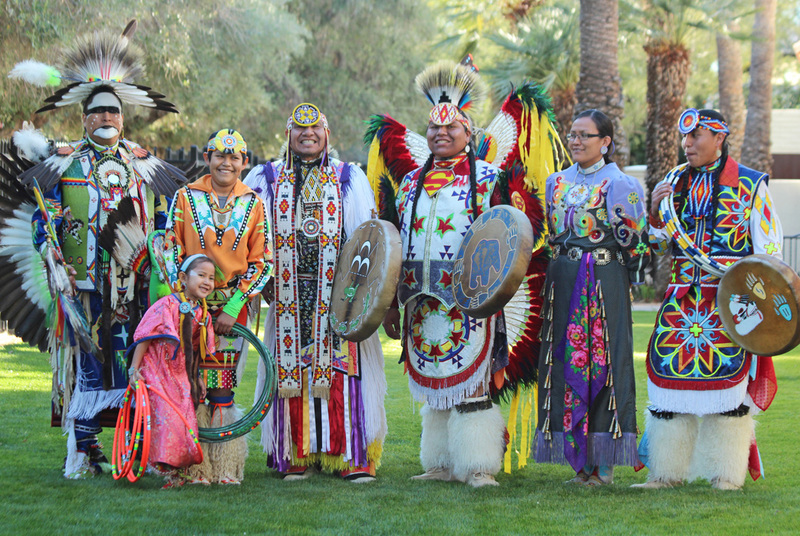 Many traditional songs and chants are still sung during spiritual rituals, feasts, mawiomi (gatherings), cultural ceremonies and powwows. In some cases, Mi’kmaq chants consisted of vocables (spoken syllables) as a means of expressing emotion, rather than words with meanings. Mi’kmaq is written alphabetically. It has single- and double-letter constants as well as five vowels that make both long and short sounds. 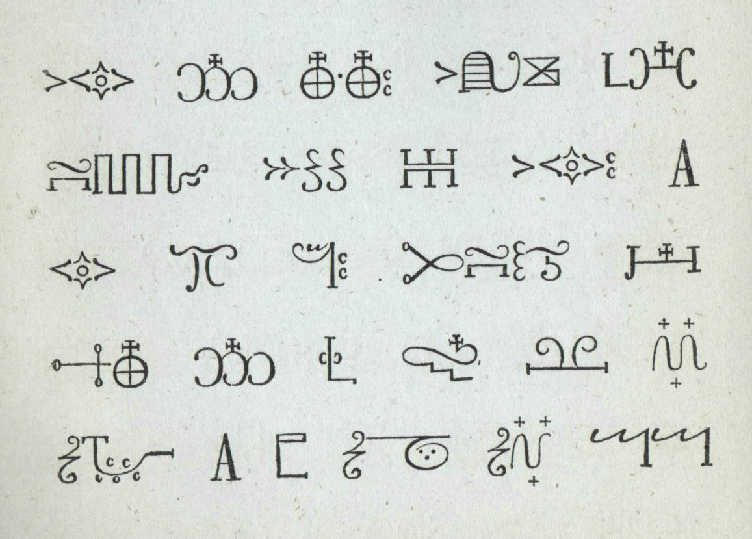 Mi’kmaq has a history of pictographs	being used, but this writing system was modified by missionaries learning the language to teach Catholicism	in the 1600s. Mi’kmaq had as many as 17 different dialects, including the unique Québec dialect Restigouche, but linguistic contact with French	and English speakers has eroded the prevalence of the language and smoothed dialectical differences. A sample of Mi'kmaq pictographs. This text transcribes the Ave Maria (1866). Despite challenges, language programs, including high school immersion programs, have helped to revitalize the language. In 1970, there were approximately 6,000 Mi’kmaq speakers, compared to the nearly 9,000 reported in 2011. However, these numbers may be misleading. While the National Household Survey asks speakers to self-report “an understanding” of a language, linguists measure health of a language by the number of fluent speakers. In 1999, a report by the Nova Scotia	Mi’kmaw Language Centre of Excellence indicated fewer than 3,000 fluent speakers. Nevertheless, Mi’kmaq is the only Indigenous language in significant active use in Mi’gma’gi (Maliseet had less than 800 speakers in 2011), and as such, is an important symbol of cultural strength and perseverance for the community. Mi’kmaq spirituality is influenced by and closely connected to the natural world. The Mi’kmaq believe that living a good, balanced life means respecting and protecting the environment and living in harmony with the people and creatures that live on the earth. Analysis of the Mi’kmaq language enhances the fundamental importance of this worldview. Rather than a sequential, time-based verb tense structure (as in English), the Mi’kmaq language is experiential, relying on the evidence of the speaker to convey meaning. The Mi’kmaq, like most Indigenous groups, use stories to tell about the past and about their spirituality. Mi’kmaq oral tradition explains that the world was created in seven stages. The Creator made the sky, the sun, Mother Earth and then the first humans: Glooscap and his grandmother, nephew and mother. From sparks of fire that Glooscap commanded to come forth, came seven men and seven women — the founding families of the seven Mi’gma’gi districts. There are many other origin stories that describe how things came to be and how to live a good life. In 1610, Henri Membertou, a Mi’kmaq chief (sagamo or sagamore), became the first Indigenous person to be baptized as a Catholic in New France, beginning a pattern of intense conversion and intermingling of customs. Mi’kmaq peoples, who had readily adapted to European trade goods, were likewise receptive to religious practices. The Concordat of 1610 — a formal agreement between the Mi’kmaq and the Vatican marked by the creation of a treaty wampum — combined trade, treaty and religion in relations between the Mi’kmaq and the French. The Concordat made the Mi’kmaq Catholic subjects, and therefore legitimized trade and other relations between settlers and Indigenous peoples in Acadia	or Mi’gma’gi. Mi’kmaq people continued to practise their own customs, but incorporated the teachings of priests who had learned the Mi’kmaq language, entrenching Catholicism into Mi’kmaq spiritual identity. Mi’kmaq religion remains firmly based in Catholicism. In the early 1990s, Mi’kmaq peoples from across Mi’gma’gi began celebrating Treaty Day (1 October) by incorporating traditional Mi’kmaq customs like drumming and the burning of sacred herbs into Catholic Mass. However, traditional Mi’kmaq spirituality is still practised today, with a concerted effort on the part of Mi’kmaq people to protect and promote their religious beliefs and customs. 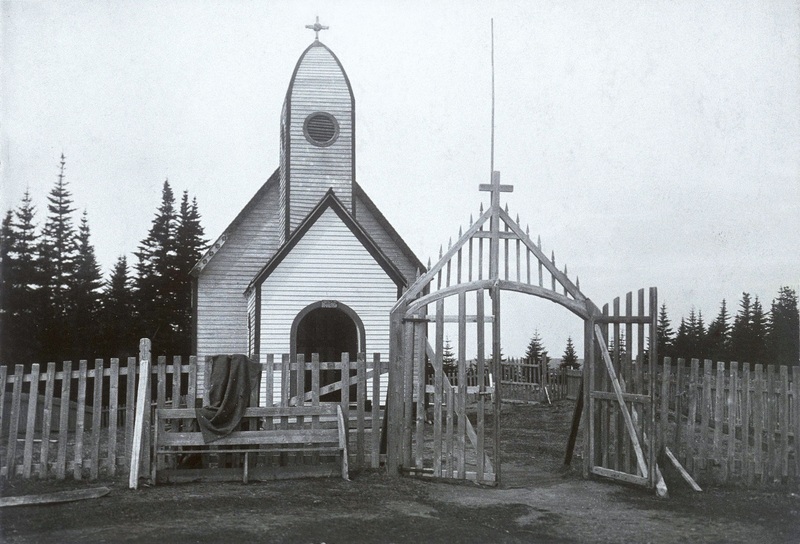 Chapel of the Mi'kmaq on the Conne River, Newfoundland and Labrador (1908). Due to their proximity to the Atlantic, the Mi’kmaq were among the first peoples in North America to interact with European explorers, fishermen and traders. As a result, they quickly suffered depopulation and socio-cultural disruption. Some historians estimate that European diseases resulted in a loss of up to half the Mi’kmaq population from about 1500 to 1600. As a result of sporadic contact and trade with European fishermen, the Mi’kmaq who encountered the first sustained European settlements in what is now Canada were familiar with the people, their goods and their trade habits. Additionally, Mi’kmaq oral history tells of a Mi’kmaq woman’s ancient premonition that people would arrive in Mi’gma’gi on floating islands, and a legendary spirit who travelled across the ocean to find “blue-eyed people.” The foretelling of the arrival of Europeans meant Mi’kmaq were prepared when they first encountered fishermen off their shores. 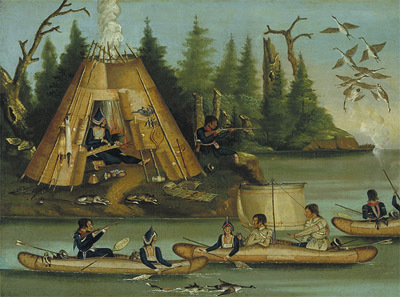 Mi’kmaq participated in the fur trade by serving as intermediaries between Europeans and groups farther west, as fur-bearing animals quickly became scarce in the face of high demand. This fundamentally altered the lifestyle of the Mi’kmaq, who focused on trapping and trading furs rather than subsistence hunting and gathering. These treaties between sovereign nations recognize the inherent Indigenous rights of the Mi’kmaq, and form the basis for modern treaty claims	and renegotiations. The Royal Proclamation of 1763, though it established Indigenous rights in much of Canada, did not mention Maritime colonies. For this reason, most post-treaty European and Loyalist settlers ignored, or were ignorant of, Mi’kmaq rights. 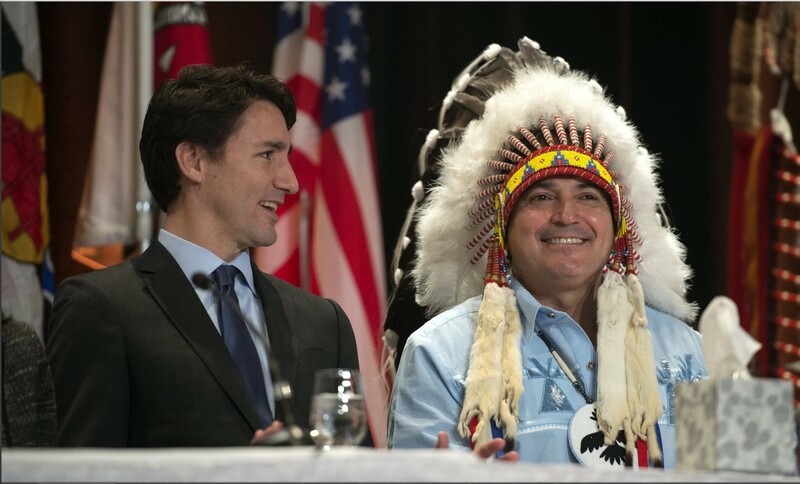 In 1985, the Supreme Court of Canada confirmed that the Mi’kmaq and the Crown have a historic relation stemming from the treaties of the 1700s, and that the Mi’kmaq have Indigenous rights to the lands described in those treaties. Ever since 1 October 1986, Treaty Day	in Nova Scotia and some other parts of Atlantic Canada has commemorated the signing and significance of the Peace and Friendship Treaties. Life under British, and later Canadian, governance was not kind to the Mi’kmaq, who were subjected to conscious attempts to alter their lifestyle. Most moves to establish them as agriculturalists failed because of badly conceived programs and encroachments upon reserve lands. Economic patterns that privileged employment as labourers effected irreversible change: crafts, coopering, the porpoise fishery, and road, rail and lumber work integrated the Mi’kmaq into the 19th- and 20th-century economy, but left them socially isolated. As with many Indigenous peoples in Canada, the Mi’kmaq are strongly affected by the lasting trauma of residential schools. Adding to this cultural, generational and economic dislocation, in the 1940s, the Department of Indian Affairs forced more than 2,000 Mi’kmaq people living in numerous small communities to relocate to government-designated reserves. The moves, undertaken for the sole purpose of streamlining government administration were fraught with mismanagement and experimental tactics, and had disastrous effects on the communities. Homes, churches and industries were abandoned and replaced with poor conditions and economic dependency. In 2015, there were 13 Mi’kmaq nations in Nova Scotia with a total registered population of 16,268. New Brunswick’s nine nations included 8,210 registered people, while the two nations in each of Prince Edward Island and Newfoundland and Labrador	had populations of 1,294 and 26,966 respectively. The three Québec nations had a total population of 6,025. Before 2011, the population of registered Mi’kmaq people in Newfoundland and Labrador was significantly lower; in that year, the federal government recognized the status of more than 23,000 Mi’kmaq people, who formed the Qalipu Mi’kmaq First Nation. The formation of the Qalipu is one example of continued activism among Mi’kmaq people. In 1999, the Supreme Court of Canada affirmed the rights of Donald Marshall, Jr., and thus all Mi’kmaq peoples, to a “moderate livelihood” through hunting and fishing rights. Marshall had been convicted in 1996 of fishing out of season, but the court ruled that the Peace and Friendship Treaties, signed in 1760 and 1761, guaranteed Mi’kmaq these rights. The decision sparked what is known as the Burnt Church Crisis, where tensions reached a boiling point between Mi’kmaq and non-Indigenous fishermen, who argued that unchecked harvesting in the lobster	fishery would lead to devastation of stocks. Despite the pacifist lobbying of organizations like the Bay of Fundy Inshore Fishermen’s Association among their own members, some non-Indigenous fishermen destroyed Mi’kmaq traps and other equipment. The situation threatened to devolve into violence. The federal government brought the crisis to somewhat of a close by buying licences and equipment from some non-Indigenous fishermen and entering into agreements with several Mi’kmaq communities to regulate a commercial fishery. Other Mi’kmaq communities did not reach agreements, and continue to petition the federal government to recognize treaty rights. In October 2013, members of the Elsipogtog First Nation in New Brunswick organized a demonstration against natural gas fracking being conducted on Crown land near their community. 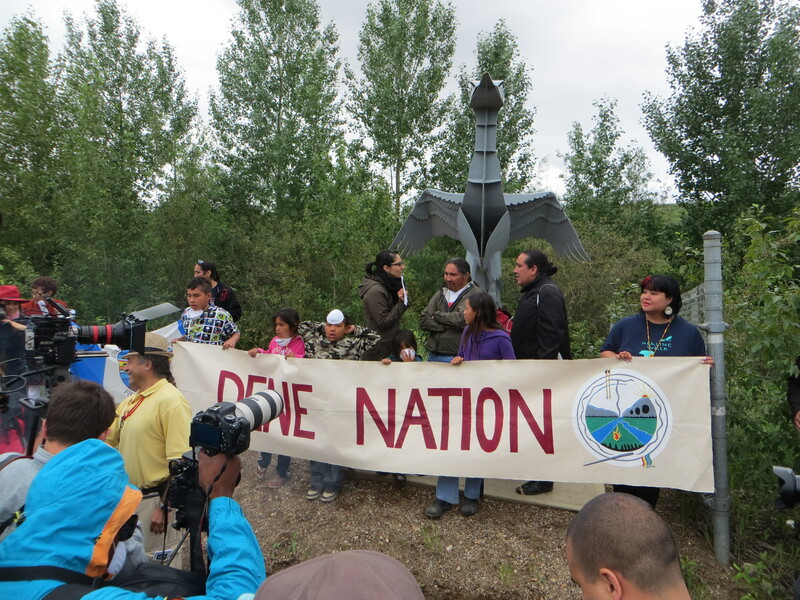 The protests centred on environmental arguments against fracking and the unceded nature of the territory in question. Protesters erected blockades on Highway 11 and several organizers were arrested. Non-violent protesters faced off against RCMP	officers, producing iconic images and reigniting debate over the scope of Aboriginal title and the politics of environmental stewardship within an industrial economy. Harold Franklin McGee, Jr., dir., The Native Peoples of Atlantic Canada (1984). A.G. Bailey, The Conflict of European and Eastern Algonkian Cultures, 1504–1700 (2nd ed., 1969). Harold Franklin McGee, Jr., ed., The Native Peoples of Atlantic Canada (1984). Harald Prins, The Mi'kmaq: Resistance, Accommodation and Cultural Survival (1996). B.G. Trigger, ed., Handbook of North American Indians, vol. 15: Northeast (1978).